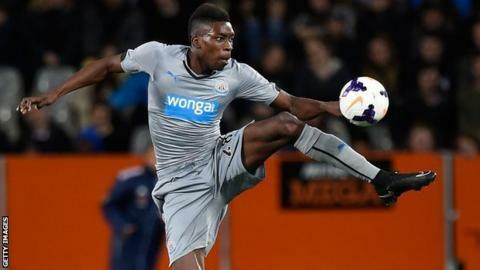 Newcastle forward Sammy Ameobi has opted to play for Nigeria. The 22-year-old has represented England at under-21 level but will follow his older brother Shola's lead and play for the country of their parents. "It wasn't a difficult decision because I decided to follow my heart and I think it's the right thing to do," Ameobi told BBC Sport. "I saw Shola at the World Cup and for him to play at a major tournament like that is a big motivation." Kalu and Ikechukwu Uche were the last brothers to play for the west African country, and the younger Ameobi hopes he and his sibling - who was released by Newcastle this summer - can play in the same national side. "It would be nice, but I need to work extremely hard at club level to get the attention of the Nigerian coaches," he said. "The country has a lot of talent. I just want to do well and hopefully get a chance with the Super Eagles." Sammy Ameobi made his debut for Newcastle in May 2011, but was loaned to Middlesbrough for the second half of the 2012-13 season. He was back at St James' Park last term but made only 12 appearances and acknowledges he is about to begin an "important" campaign. "Performing well on a regular basis with your club is the only way to prove yourself," he said. "When you give everything and do well then you'll fancy your chance to get a call up to the Nigeria squad."